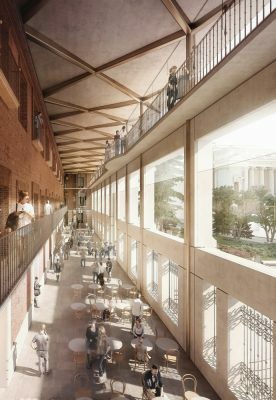 Foster + Partners and Rubio Arquitectura have won the international competition to revitalise and refurbish the historic Hall of Realms (Salón de Reinos) as a new addition to the Museo del Prado campus in Madrid. 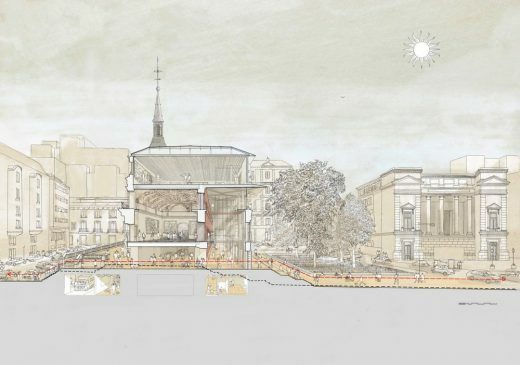 The vision is to create a new public focus for the city by bringing together the various buildings that comprise the Prado with public spaces and underground links. The Hall of Realms is a noble structure and one of the very few that have survived from the former Palacio del Buen Retiro of the seventeenth century. It has been the subject of changes and expansion, gathering many layers of history over the centuries. The interventions will bring fresh life to the magnificent interiors from the past as well as adding new state-of-the-art galleries and public spaces. The proposal goes back four centuries to re-discover the original three storey southern façade. This becomes the backdrop for a spectacular new space within the building. The existing outer walls have been delicately opened up to bring light and views in from the new civic plaza. The transformed Hall of Realms will be permeable, offering a new public route through the building with terrace cafes on the north side. Working within the outline of the original building envelope a new roof will harvest energy from integrated solar cells, give natural light to the galleries below and cantilever as a shade to protect the southern façade. It also heralds the rebirth of this historic monument. Foster + Partners were one of eight architects from four countries shortlisted for the international competition. •	Office for Metropolitan Architecture (O.M.A.) Stedebouw B.V. The competition brief was to restore the Hall of Realms of the Palacio del Buen Retiro and create additional display space for permanent and temporary exhibitions at the Prado in Madrid. 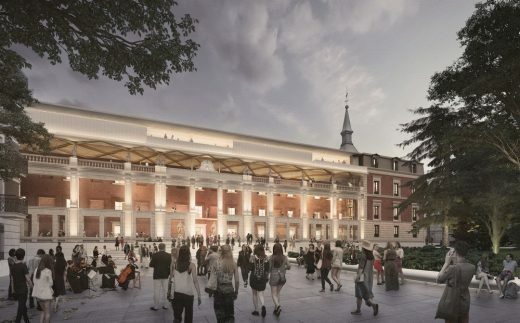 The addition of this building to the Museo del Prado’s Campus, will form part of the Museum’s 200th anniversary celebrations in 2019. The competition was open to both Spanish and non-Spanish architectural practices, from which eight were selected to produce preliminary proposals.